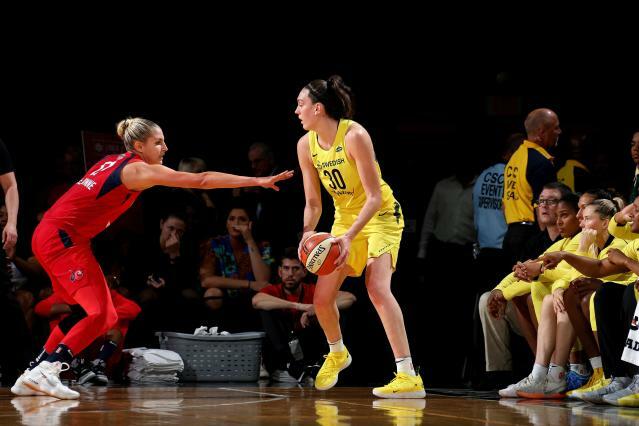 The Seattle Storm and superstar Breanna Stewart confirmed the dreaded news Wednesday that had been percolating for days. Stewart, coming off the most decorated 12 months in the history of professional basketball, will miss the entire 2019 WNBA season with a ruptured right Achilles tendon suffered in a EuroLeague championship game. “This year especially has been amazing and filled with lots of successes and as we all know there are highs and lows throughout a career,” she wrote. Stewart helped lead the Storm to the 2018 WNBA championship, winning the WNBA MVP award and the Finals MVP award. She then led Team USA to a gold medal at the FIBA Women’s Basketball World Cup, where she won MVP. She was named the 2018 USA Basketball Female Athlete of the Year. She led her Russian team to the EuroLeague championship, though it fell short, and was named the league’s MVP. Stewart is a four-time NCAA champion and four-time tournament Most Outstanding Player with UConn. While playing for Dynamo Kursk in the EuroLeague championship game Sunday, Stewart landed on the foot of Phoenix Mercury star and UMMC Ekaterinburg player Brittney Griner. Stewart had to be helped off the court and went back to Seattle for tests on Monday to confirm what was thought to be an Achilles injury. Issues arose with timing, according to ESPN’s Mechelle Voepel, and there was no news from the team Monday, nor was there news from the Storm on Tuesday. Stewart’s father told Syracuse.com on Monday she tore her Achilles and the Dynamo Kursk announced on Tuesday she had a torn Achilles, per Kelli Stacy at the Hartford Courant. Seattle was expected to announce Wednesday and did so shortly after Stewart posted to Twitter. According to the release, Stewart will undergo surgery by Dr. Neal ElAttrache of the Kerlan-Jobe Orthopaedic Clinic at Cedars-Sinai in Los Angeles at a to-be-determined date. She is expected to miss the 2019 season, but “make a full recovery for the start of the 2020 season,” per the team. The Storm open training camp May 5 and begins the 2019 season in late May. An injury can happen anywhere and anytime, but Stewart’s is forcing the conversation about why women professional basketball players are playing year-round. The WNBA pays a max salary of $113,500 with most players making far less than that. Stewart, a 2016 draft pick, is still on her rookie contract and makes around $65,000. The “meh” payday results in players going to Europe, where they can make up to 10 times as much per season in some cases. Forbes reports the starting salary is $100,000 in Europe, double that of the WNBA. Replies popped up on Twitter of Stewart and her Maserati, arguing players clearly make enough. And they could easily live off of money from European leagues alone, ditching the WNBA in a move some stars have done in recent years. But players want to play in front of their home country’s fans, in stadiums they grew up watching, while growing a game on their home soil. The pay in the WNBA doesn’t allow them to do that without supplementing their income, and restrictive rules keep them from earning income off many other non-playing basketball jobs. Brian Stewart, Breanna’s father, told Syracuse.com’s Donna Ditota it was a freak accident, but as anyone can attest more playing time means more risk of injury. “Wear and tear, long-term, is definitely going to be a factor for somebody like Bre. Unfortunately, since probably eight or nine years ago, this is going to be the longest break, by far, she’s ever had. Kind of forced. She pretty much goes year-round, like all the other players like her." Stewart’s injury will likely play into the negotiations that range from salaries to marketing and playing conditions.